Come to the Animals for Ava Fundraiser! One of my favorite people, Dante Puorro of Investors Home Mortgage, is throwing a fundraising event that I want all of you to know about. Bring your friends and family for an evening of fun at the Turtleback Zoo on June 22nd. Your contribution will raise funds for the National Foundation of Ectodermal Dysplasias. Please read the message from the Puorros below to learn more about this genetic condition and how you can help. It’s going to be an amazing evening for everyone and I hope you’ll all come! “Please join The Puorro’s and Investors Home Mortgage on June 22nd at The Turtle Back Zoo from 6-10pm for a night of train & carousel rides, food, fun and a silent auction in an effort to raise awareness and funds for Ectodermal Dysplasia. Come have fun with us at Ava’s favorite place! The National Foundation of Ectodermal Dysplasias not only helps us, but helps many other families financially and most importantly, emotionally. This amazing foundation supported us when others couldn’t, therefore, we are looking forward to supporting them. 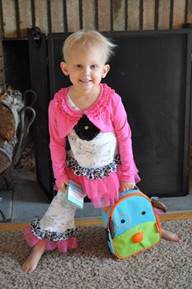 Ava was born with Hypohidriotic Ectodermal Dysplasia (HED). It is a genetic condition affecting the hair, skin, nails, and teeth. Ava’s hair is very sparse and her baby teeth never developed. The NFED encouraged us to get her first set of dentures as early as possible. Ava did remarkably well during the whole process at the young age of 2. Her sweat glands are underdeveloped, causing her to overheat very rapidly during warm weather. Despite these obstacles, Ava is a typical 4 year old little girl. She is a happy child full of life who just wants to have fun! Help us make a difference in the lives of children and adults affected by Ectodermal Dysplasias like Ava. The rain date for this event will be held on Sunday, June 23rd from 6 to 10 pm. Admission is Free!